OBJECTIVE: To analyze household smoking-ban prevalence over time and predictors among communities in the Dominican Republic, historically a significant tobacco-growing country with few tobacco control regulations. METHODS: Baseline (2004) and follow-up surveillance surveys (2006, 2007) (each n > 1 000 randomly selected households) conducted in six economically disadvantaged communities (three tobacco-growing and two each urban, peri-urban, and rural) assessed household members' demographics, health status, and household characteristics, including smoking restrictions. RESULTS: Between 2004 and 2007, household smoking-ban prevalence increased in all communities, with overall rates increasing from 23.9% (2004) to 45.3% (2007). Households with smokers adopted smoking bans at lower rates (6%17%) versus those without smokers (which had an adoption rate of 35%58%). Logistic regression models demonstrated that the associations between allowing smoking in households with no members who smoked and being located in a tobacco-growing community, being a Catholic household, and having a member with a cardiovascular problem were statistically significant. The association between having a child under age 5 or a member with a respiratory condition and prohibiting smoking in the home was not statistically significant. CONCLUSIONS: Prevalence of households banning smoking increased in all communities but remained well below rates in industrialized countries. For low- and middle-income countries or those in early stages of tobacco control, basic awareness-raising measures (including surveillance activities) may lead to statistically significant increases in household smoking-ban adoption, particularly among households with no smokers. An increase in household smoking-ban prevalence may result in changes in community norms that can lead to a further increase in the adoption of smoking bans. Having household members who smoke and being in a tobacco-growing community may mitigate the establishment of household bans. Increasing individuals' knowledge about the far-reaching health effects of secondhand smoke exposure on children and nonsmoking adults (healthy or unhealthy) may help overcome these obstacles. Key words: Tobacco smoke pollution; Dominican Republic. OBJETIVO: Analizar la evolución de las prohibiciones de fumar en los hogares con el transcurso del tiempo, y los factores predictivos de estas prohibiciones en las comunidades de la República Dominicana, un país que históricamente ha sido un importante productor de tabaco con pocas regulaciones en cuanto a su control. MÉTODOS: Se llevaron a cabo un estudio inicial (2004) y estudios de vigilancia posterior (2006 y 2007) (cada uno de ellos con un tamaño de muestra n superior a 1 000 hogares seleccionados aleatoriamente) en seis comunidades económicamente desfavorecidas (tres productoras de tabaco, y dos de cada uno de los entornos urbano, periurbano y rural), y se evaluaron los datos demográficos de los miembros de los hogares, su estado de salud y las características de los hogares, incluidas las restricciones al consumo de tabaco. RESULTADOS: Entre el 2004 y el 2007, la prevalencia de la prohibición de fumar en los hogares aumentó en todas la comunidades, con un incremento general de las tasas de 23,9 (2004) a 45,3% (2007). Las tasas de adopción de prohibiciones de fumar en los hogares con fumadores fueron inferiores (de 6 a 17%) a las de los hogares sin fumadores (de 35 a 58%). Los modelos de regresión logística demostraron una asociación estadísticamente significativa entre la permisividad con el tabaco en los hogares sin miembros fumadores y la pertenencia a una comunidad productora de tabaco, profesar la religión católica y la presencia de un miembro afectado por una enfermedad cardiovascular. La asociación entre la presencia de un niño menor de cinco años o de un miembro afectado por una enfermedad respiratoria y la prohibición de fumar en el hogar no fue estadísticamente significativa. CONCLUSIONES: La prevalencia de hogares en los que se prohibía fumar aumentó en todas las comunidades pero se mantuvo bastante por debajo de las tasas de los países industrializados. En los países con ingresos bajos y medianos, o que se encuentran en fases iniciales del control del tabaco, las medidas básicas de sensibilización (incluidas las actividades de vigilancia) pueden conducir a incrementos estadísticamente significativos de la adopción de la prohibición de fumar, en particular en los hogares sin fumadores. Un aumento de la prevalencia de hogares en los que se prohíba fumar puede dar lugar a cambios en las normas de la comunidad que a su vez comporten un aumento adicional de la adopción de prohibiciones de fumar. La presencia en el hogar de miembros fumadores y la pertenencia a una comunidad productora de tabaco pueden mitigar el establecimiento de prohibiciones en los hogares. El incremento de la información proporcionada a las personas sobre los importantes efectos sobre la salud de la exposición pasiva al humo de tabaco de los niños y los adultos no fumadores (sanos o enfermos) puede ayudar a superar estos obstáculos. Palabras clave: Contaminación por humo de tabaco; República Dominicana. Rates of smoking and associated secondhand smoke (SHS) exposure are increasing globally, with the greatest increases occurring in low- and middle-income countries (LMICs) (1). Further reducing SHS exposure is a basic tenet of tobacco control to reduce the prevalence of smoking, establish regulations restricting tobacco use in workplaces and public areas, and promote smoke-free homes (26). SHS exposure affects morbidity and mortality among nonsmoking adults (development of lung cancer and cardiovascular problems) and children (increased risk of Sudden Infant Death Syndrome (SIDS), acute and chronic respiratory problems, and ear problems) (37). The U.S. Surgeon General's report cites the home as the primary site of major SHS exposure (79). Home smoking bans are directly associated with better health status (911) and represent another mechanism to reduce the differential exposure and increased vulnerability experienced by disadvantaged populations (12). While regulations can limit or eliminate SHS exposure outside the home, regulating exposure inside homes is the household's purview. U.S. tobacco control efforts promoting smoke-free homes have led to increases in household bans. The Tobacco Use Supplement to the Current Population Survey compared data on household smoke-free rules between 1992 and 2003 (4). This continuous monthly household survey conducted by the U.S. Census Bureau for the Bureau of Labor Statistics of the U.S. civilian, noninstitutionalized population queries respondents (> 14 years old) about smoking inside the home. By 2003, 72.2% of households surveyed (n = 127 332) across the 50 states and the District of Columbia reported being smoke-free (not allowing smoking anywhere inside the home)an increase of 67.1% from the 19921993 rate of 43.2% (4). In addition, the 2008 Behavioral Risk Factor Surveillance Survey, a state-based, random-digitdialed telephone survey conducted among a similarly defined group of adults older than 17 years, reported household smoke-free bans across 11 participating states. Nonsmokers were more likely to report a complete household ban (median: 87.7%) compared to smokers (45.0%) (13). This trend is not unique (14); the International Tobacco Control (ITC) Four Country Survey found similar trends in other English-speaking countries (15). Among the more than 9 000 randomly selected smokers, household bans increased between 2002 and 2003 to 19.0%, 31.5%, and 43.1% in Canada, United Kingdom, and Australia respectively. The presence of children and nonsmoking adults increased the likelihood of a home being designated as smoke-free. Subsequent studies reconfirmed these findings (1620). The Dominican Republic (DR) is historically a significant tobacco-growing LMIC and remains the only Latin American or Caribbean country that has not signed onto the Framework Convention on Tobacco Control (2). This lack of national action on tobacco control is consistent with the country's limited national and local tobacco control regulations despite increasing tobacco-related morbidity and mortality rates (21). Although DR regulations limiting SHS exposure in public or work areas were enacted in 2000, awareness of any restrictions was virtually absent (21, 22). No awareness campaigns about the deleterious effects of tobacco use on the smoker or of SHS on the nonsmoker have been conducted. 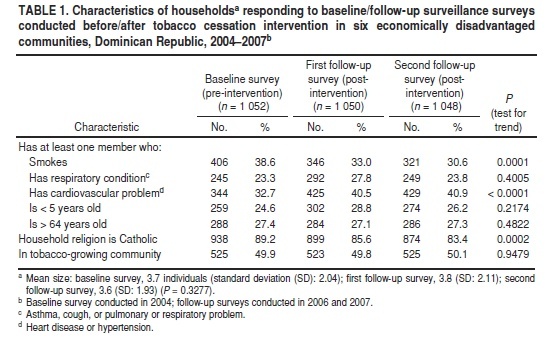 In 2003, during the initial (qualitative) phase of the project described in this study, community members from six economically disadvantaged communities described places where smoking was not allowed (e.g., local businesses (manager decision); selected public places (e.g., churches); and public transit) out of "respeto" (respect) for others. These actions represented community self-regulation rather than adherence to governmental regulations (21). Few community members mentioned passive smoking (SHS) or household restrictions during the 2003 interviews. Individuals choosing to smoke outside did so to hide their smoking, not to reduce others' SHS exposure. This lack of knowledge is consistent with elevated risk exposure (12). Despite the above history, there are no published studies of household smoking bans in the DR or Caribbean. This report provides the first analysis of household smoking-ban prevalence over time and associated factors among economically disadvantaged DR communities. These analyses used data drawn from a larger study of tobacco cessation in the DR known as Proyecto Doble T (Project Double T, with the "Ts" standing for technology and tobacco). The project began with formative research about tobacco attitudes and practices in six economically disadvantaged DR communities, followed by household and smoker surveillance surveys (2123). Post-survey, the U.S.-DR research team deployed a multifaceted intervention (posters, fairs, community charlas (talks)) in the three intervention communities to raise awareness about the health effects of smoking and to provide cessation resources (e.g., training local intervention specialists and both professional and para-professional health care workers) (23, 24). The intervention was replicated in control communities following a one-year comparison period. The cessation intervention was not specifically designed to promote household smoking bans. Household surveillance data were collected systematically in six communities (two small urban, two peri-urban,1 and two rural; within each pair, one was tobacco-growing and one was not, and one was a control and the other an intervention site). Data collection took place in 2004 (baseline survey) and was repeated in 2006 post-intervention (first follow-up survey) and again in 2007 after the control communities received the intervention (second follow-up survey). Initial analyses of household smoking bans (which included data from all three surveys) and subsequent analyses (which were limited to the follow-up surveys) were conducted using SAS/STAT software, version 9.1.3 (SAS System for Windows, SAS Institute, Cary, NC, USA). As described in Ossip-Klein et al. (23), each surveillance survey included 170175 households per community, for a total of 1 052 homes in the baseline survey; 1 040 in the first follow-up survey; and 1 048 in the second follow-up survey. All three surveys used the same procedures (randomly selected households approached by trained data collectors hired by the DR-based team). In the baseline survey, 207241 households per community were approached, for a completion rate of 73%85%. The first follow-up survey covered 201250 households per community (71%87%) and the second follow-up survey covered 183222 households per community (78%96%). The households surveyed at baseline were not systematically included or excluded from the follow-up surveys. As each survey represented less than 10% of available households, inclusion in subsequent surveys was unlikely. Interviews were conducted with the first available adult member (≥ 18 years old) who could respond to questions regarding basic household demographics, tobacco use, and health conditions of all adult household members. The survey item to assess smoke-free home practices was adapted from the ITC policy survey (24). Modifications were implemented based on pretesting to ensure that the survey item would be readily understood by the respondents. The question used to assess household smoking restrictions (English translation) was "Which of the following best describes smoking in your household?" (possible responses: "Smoking is allowed in your home"; "Smoking is never allowed in your home"; "Smoking is allowed in your home for some people"; "Smoking is allowed in your home just in some places"; and "Other"). Additional survey items were drawn from multiple standard questionnaires and translated into Spanish using a back-translation method (25). Descriptive analyses of sample characteristics included testing for trend. Subsequent bivariate analyses of changes in household smoking bans (chi-square and Student's t-test) and multivariate analyses (logistic regressions) were undertaken to identify factors associated with household bans. Model fit was assessed using the Pearson method. To protect respondent anonymity the analyses used only de-identified household data. Verbal consent and survey administration procedures, developed and approved by institutional review boards and independent ethics committees in the United States and the DR, were used (26). The characteristics of the households responding to the three surveys varied (Table 1). More than 30% of all households surveyed had at least one member who smoked. The decreasing population over time was statistically significant (38.6% at baseline versus 30.6% in the second follow-up survey; P < 0.0001). In all three surveys more than 20% of households had a member with a respiratory illness (23.3% at baseline, 27.8% in the first follow-up survey, and 23.8% in the second follow-up survey; differences not statistically significant). The increase over time in households that had a member with a cardiovascular problem was statistically significant (32.7% at baseline, 40.5% in the first follow-up survey, and 40.9% in the second follow-up survey; P < 0.0001). More than 80% of all households surveyed were Catholic, with a statistically significant decline over the three periods (from 89.2% to 85.6% to 83.4%; P < 0.001). No other statistically significant differences were found. For analytical purposes, and to focus on the target behavior (establishment of a household smoking ban), responses to the question "Which of the following best describes smoking in your household?" were dichotomized into "No smoking allowed' and "Any smoking allowed." Aggregating households across all communities, those reporting a total smoking ban increased from 23.9% at baseline to 35.9% (first follow-up survey) and 45.3% (second follow-up survey). As depicted in Table 2, these differences were statistically significant (P < 0.0001; test for trend). Comparisons by community type (urban, peri-urban, and rural) at baseline revealed smoking bans among 21.5%27.5% of households, with statistically significant increases in household smoking-ban uptake in all communities by the second follow-up survey (P < 0.001). This increase was lowest among rural communities (36.7%) but at least doubled in peri-urban and urban communities (45.9% and 53.6% respectively). Between-community differences were not statistically significant (data not shown), so subsequent analyses used data aggregated across community type. Statistically significant increases (P < 0.0001) were found for both intervention and control community households (data not shown). As expected, a difference-of-differences analysis comparing intervention and control conditions between baseline and the second follow-up survey did not show statistically significant results because the tobacco cessation intervention did not focus on passive smoking or smoke-free homes. Therefore, subsequent analyses used data aggregated across intervention conditions. Additional chi-square analyses compared the presence of household smoking bans based on being in a tobacco-growing community or not. Initially, only 19.6% of households in a tobacco-growing community had bans, compared to 28.2% in non-tobacco-growing communities. By the second follow-up survey (2007), the increase in smoking bans in both types of communities was statistically significant, with larger increases occurring in non-tobacco-growing communities (59.8% versus 30.8% in tobacco-growing communities). The difference in smoking ban prevalence between households with at least one smoker and households with no smokers (irrespective of community type) was statistically significant (Table 2). While statistically significant increases in household smoking bans were found in both groups (P < 0.0001), including high-risk (smoker) homes, the actual difference in the proportion of households with smoking bans was striking. For example, by 2007 (the second follow-up survey), 57.7% of households without a smoker had smoking bans, compared to only 16.7% of households with a smoker (P < 0.0001). A difference-of-differences analysis confirmed the absence of any intervention effect on the smoker households or the nonsmoker households (data not shown). Subsequent analyses were undertaken separately for households with and without a smoker. The final analyses focused on factors associated with households allowing any smoking (under any circumstance) versus households with complete smoking bans. Five household variables and one community variable were examined based on prior research (1618) and the initial (qualitative) findings of the project (19). These variables included: religion ("Catholic" versus "not Catholic," with the latter group including those who did not answer the question and those who provided the following responses: "Adventist," "Evangelist," "voodoo," "don't know," and "none"); presence of at least one household member < 5 years old or > 64 years old; household member with a respiratory condition (aggregate variable included asthma, cough, and pulmonary or respiratory problem); and member with a cardiovascular problem (heart disease and/or hypertension). The one community characteristic was: "tobacco-growing." Table 3 depicts the distribution of these characteristics stratified by households with and without a smoker for the baseline survey and the second follow-up survey, comparing those with and without household smoking bans. Among households without a smoker, those that allowed smoking were more likely to be in tobacco-growing communities (48.4%) relative to those with a ban at baseline (39.5%; P < 0.05). This statistically significant difference increased in the second follow-up survey, which showed that nearly two-thirds (61.8%) of households without a smoker that allowed smoking were in tobacco-growing communities, where only 29.3% of these households had bans (P < 0.001). In the second follow-up survey, households without a smoker but allowing smoking were also more likely than those banning smoking to have a member with a cardiovascular problem (44.9% versus 32.2%; P < 0.001) and were more likely to be Catholic (87.3% versus 77.5%; P < 0.001). 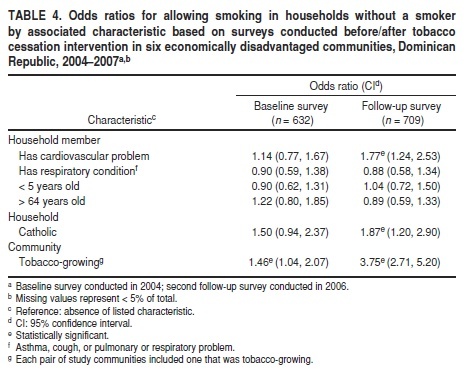 For households with a smoker the only variable with a statistically significant association with not having a smoking ban at baseline was having a household member with a respiratory condition (27.5% of households without a ban had a household member with a respiratory condition, compared to only 8.0% among households with bans; P = 0.032) (Table 3). No statistically significant differences were found for this variable in the second follow-up survey. All six variables were entered into full logistic regression models to identify factors associated with allowing household smoking. For households without a smoker, the models for the baseline and second follow-up surveys demonstrated good fit (based on the Pearson chi-square test) and had statistically significant associations (Table 4). At baseline, being in a tobacco-growing community was the only variable with a statistically significant association with allowing household smoking (odds ratio (OR): 1.46; 95% confidence interval (CI): 1.04, 2.07). The OR increased in the second follow-up survey (2007), when being in a tobacco-growing community made it more than three times more likely that a household would allow smoking (OR: 3.75; 95% CI: 2.71, 5.20). In that survey, being a Catholic household and having someone in the household with a cardiovascular problem were both associated with increased likelihood that smoking would be allowed (OR: 1.87; 95% CI: 1.20, 2.90 and OR: 1.77; 95% CI: 1.24, 2.53 respectively). Among households with a smoker, no statistically significant associations and poor model fit were found for both the baseline and second follow-up survey (data not shown). This may be due to the relatively small number of households in that subgroup that banned smoking. 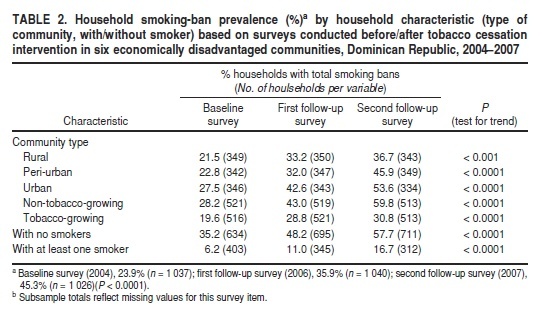 The prevalence of household smoking bans among six economically disadvantaged communities in the DR increased from 23.9% at baseline to 45.3% two years later. While promising, there remains considerable room for improvement across all communities, as more than half of the participating households continued to allow smoking with some or no restriction, well below rates in industrialized countries (5, 6). The observed increase in smoking bans occurred in the absence of any national or local tobacco control activities outside of the study project. Because the project did not focus on household smoking bans or passive smoke exposure, the uptake of bans was, as expected, non-differential between intervention and control communities. Given the absence of prior community interventions related to passive smoke, asking the question about having a household ban (along with multiple other questions regarding tobacco and health risks) in the baseline surveillance survey may have itself raised awareness about the option of banning household smoking. This phenomenon has been described by others (2728). Increases also differed by type of community and by whether any household member smoked. Prevalence of household bans increased over time in households with and without a smoker but was dramatically higher among households without a smoker. In households with a smoker, despite small but statistically significant increases in smoking bans, no factor had any consistent association (predictive or protective) with allowing household smoking. This finding, consistent with previous studies (2932), reaffirms that having a smoker in the house may mitigate the establishment of these bans. In contrast, Binns et al. (18) found that a ban was more likely if the smoker lived with a nonsmoker or with a child under age 5. In examining only households without a smoker, being located in a tobacco-growing community was strongly associated with allowing smoking at baseline. While being in a tobacco-growing area likely detracts from tobacco control efforts (15), this study demonstrates its specific mitigating influence on home smoking bans. While not significant at baseline, several findings have implications for future interventions at the community and national levels, particularly in relation to the general population's awareness of the broad impact of smoking on both healthy and unhealthy adults. Having a household member with a cardiovascular problem was strongly associated with allowing household smoking, even when controlling for the presence of an older household member. While it may seem counterintuitive to allow smoking in a nonsmoking household, especially in the presence of someone with a cardiovascular problem, this phenomenon may be explained by the fact that individuals with a cardiovascular problem may be former smokers, so the household may simply be continuing a practice of allowing smoking that began prior to the household member's diagnosis. It may also be attributable to community members' general lack of awareness of the effect of smoking on cardiovascular health (20, 22), or to household members having friends who smoke. Several authors noted that external factors (e.g., prevalence of friends or visitors who smoke or have cravings) might decrease the establishment of complete home smoking bans (1920, 2932). Finally, increased cardiovascular disease prevalence may have been a consequence of SHS exposure in homes with no ban (19). Understanding the far-reaching health effects of SHS exposure is an important missed intervention opportunity that could lead to greater prevalence of household smoking-ban implementation. Contrary to previous studies (11, 17, 1920), in this study, having children or someone with a respiratory problem in the home did not influence household smoking bans. This result, which was similar to Ji et al. 's finding among urbanized Chinese households (30), underscores the need for awareness-raising on the harms of SHS to increase the prevalence of home-smoking bans and reduce SHS exposure among children and nonsmoking adults. The relationship between religion and household smoking bans has not been previously identified. Being Catholic was associated with allowing household smoking even among households without a smoker. Based on the qualitative work conducted for this project, this may be attributable to the strong anti-smoking messages promulgated by the other prevalent religions in the DR (Adventist and Evangelical). Religion and religious beliefs do not feature prominently in findings from other research on home smoking bans (1720, 2932). The major limitation of this study is reliance on self-report by the house-hold member interviewed. Respondents may have provided socially acceptable responses. Given the prevalence of smoking, lack of tobacco control initiatives, and low awareness of smoking's health effects, it is not clear which responses would be considered socially acceptable in these communities. In addition, while it is likely that some of the findings are applicable to other disadvantaged DR or Caribbean communities, caution is warranted to not overgeneralize. The major strength of this exploratory analysis is its surveillance in understudied disadvantaged communities in a historically tobacco-growing country with limited tobacco control initiatives. The focus on disadvantaged communities within an LMIC provides an opportunity to address health disparities within vulnerable populations who bear the greatest brunt of the tobacco epidemic (12). The finding that smoke-free homes increased in these communities demonstrates that this type of change is feasible and initial results can be achieved without significant effort. The use of local data collectors, rigorous sampling and surveillance techniques, and local capacity building for tobacco control provided for adequate numbers of participating households for analysis (23). The study results also documented key differences in household smoking bans between households with and without a smoker, and across community types, and demonstrated the potential ripple effect of a smoking cessation project on home smoking restrictions. In communities with no prior tobacco control initiatives, the prevalence of households banning smoking increased to nearly 50% overall, possibly due to the surveillance process itself. While households with and without a member who smoked were more likely to report smoking bans over the course of the study, a more dramatic increase was found among those without smokers. This is encouraging for an LMIC such as the DR that devotes few national resources to tobacco control. For communities in an LMIC (and by extension LMICs) in the early stages of tobacco control initiatives, small measures may have large effects. Including a question about household bans on health surveys or providing information at health fairs or through other media may lead to significant increases in the prevalence of smoking bans, particularly among nonsmoking households. Given the newly discovered relationship between smoking bans and religion, collaboration with or outreach through churches should also be considered. This study also highlights the far-reaching effect of being in a tobacco-growing community, underscoring the challenge of implementing tobacco control interventions such as household smoking bans within that environment. Consistent with the role of social determinants on health among disadvantaged populations (12), across all households, lack of knowledge about the harmful health effects of smoking appeared to influence whether household bans were established. Programs specifically designed to encourage discussion of the detrimental health effects of SHS on children and adult nonsmokers (healthy and unhealthy) may be essential to increase further the prevalence of household smoking bans. These may need to be specifically tailored for tobacco-growing communities. Establishing smoking bans in households with smokers represents a separate challenge. Where tobacco control initiatives are few, interventions specifically designed to target homes with smokers may be warranted. Given these promising findings, the DR is encouraged to implement policies and programs to promote the establishment of household smoking bans. While different strategies may be needed for homes with smokers, increasing bans among households without a smoker may lead to changes in community norms, which in turn may influence ban establishment in households of smokers. Acknowledgments. The authors thank the office staff at the University of Rochester and at the headquarters of Proyecto Doble T in the Dominican Republic; the site coordinators and data collectors in the participating communities; and the survey respondents who gave their time to this project. Funding. This investigator-initiated work was supported by the National Institutes of Health (NIH) Fogarty International Center (grant no. TWO5945) and National Cancer Institute (NCI) (grant no. R01 CA132950). The funder played no other role in this work. 1. World Health Organization. WHO report on the global tobacco epidemic, 2011: warning about the dangers of tobacco. Geneva: WHO; 2011. Available from: http://www.who.int/tobacco/global_report/2011/en/index.html Accessed on 20 December 2013. 2. World Health Organization. WHO Framework Convention on Tobacco Control. Geneva: WHO; 2005. 3. Centers for Disease Control and Prevention (US). Best practices for comprehensive tobacco control programs2007. Atlanta: U.S. Department of Health and Human Services, CDC, National Center for Chronic Disease Prevention and Health Promotion, Office on Smoking and Health; 2007. 4. Centers for Disease Control and Prevention (US). Vital signs: nonsmokers' exposure to secondhand smokeUnited States, 19992008. MMWR Morb Mortal Wkly Rep. 2010;59(35):11416. 5. Fong GT, Cummings KM, Shopland DR; ITC Collaboration. Building the evidence base for effective tobacco control policies: the International Tobacco Control Policy Evaluation Project (the ITC Project). Tob Control. 2006;15 Suppl 3:iii12. 6. Wipfli H, Avila-Tang E, Navas-Acien A, Kim S, Onicescu G, Yuan J, et al. Secondhand smoke exposure among women and children: evidence from 31 countries. Am J Public Health. 2008;98(4):6729. 7. Centers for Disease Control and Prevention (US). The health consequences of involuntary exposure to tobacco smoke: a report of the Surgeon General. Atlanta: U.S. Department of Health and Human Services, CDC, National Center for Chronic Disease Prevention and Health Promotion, Office on Smoking and Health; 2006. 8. Lando HA, Hipple BJ, Muramoto M, Klein JD, Prokhorov AV, Ossip DJ, et al. Tobacco control and children: an international perspective. Pediatr Allergy Immunol Pulmonol. 2010;23(2):99103. 9. Hill SC, Liang L. Smoking in the home and children's health. Tob Control. 2008;17(1):327. 10. Wamboldt FS, Balkissoon RC, Rankin AE, Szefler SJ, Hammond SK, Glasgow RE, et al. Correlates of household smoking bans in low-income families of children with and without asthma. Fam Process. 2008;47(1):8194. 11. Behm I, Kabir Z, Connolly GN, Alpert HR. Increasing prevalence of smoke-free homes and decreasing rates of sudden infant death syndrome in the United States: an ecological association study. Tob Control. 2012;21(1):611. 12. Blas E, Kurup AS, editors. Equity, social determinants and public health programmes. Geneva: World Health Organization; 2010. 13. Centers for Disease Control and Prevention (US). State-specific secondhand smoke exposure and current cigarette smoking among adultsUnited States, 2008. MMWR Morb Mortal Wkly Rep. 2009;58(44):12325. 14. Sebrié EM, Schoj V, Glantz SA. Smokefree environments in Latin America: on the road to real change? Prev Control. 2008;3(1):2135. 15. Borland R, Yong HH, Cummings KM, Hyland A, Anderson S, Fong GT. Determinants and consequences of smoke-free homes: findings from the International Tobacco Control (ITC) Four Country Survey. Tob Control. 2006;15 Suppl 3:iii4250. 16. King BA, Hyland AJ, Borland R, McNeill A, Cummings KM. Socioeconomic variation in the prevalence, introduction, retention, and removal of smoke-free policies among smokers: findings from the International Tobacco Control (ITC) Four Country Survey. Int J Environ Res Public Health. 2011;8(2):41134. 17. Hawkins SS, Berkman L. Parental home smoking policies: the protective effect of having a young child in the household. Prev Med. 2011;53(1-2):613. 18. Binns HJ, O'Neil J, Benuck I, Ariza AJ; Pediatric Practice Research Group. Influences on parents' decisions for home and automobile smoking bans in households with smokers. Patient Educ Couns. 2009;74(2):2726. 19. Shelley D, Fahs MC, Yerneni R, Qu J, Burton D. Correlates of household smoking bans among Chinese Americans. Nicotine Tob Res. 2006;8(1):10312. 20. Yousey YK. Household characteristics, smoking bans, and passive smoke exposure in young children. J Pediatr Health Care. 2006;20(2):98105. 21. Dozier AM, Ossip-Klein DJ, Diaz S, Chin NP, Sierra E, Quiñones Z, et al. Tobacco use in the Dominican Republic: understanding the culture first. Tob Control. 2006;15 Suppl 1: i306. 22. Dozier AM, Ossip DJ, Diaz S, Sierra-Torres E, Quiñones de Monegro Z, Armstrong L, et al. Health care workers in the Dominican Republic: self-perceived role in smoking cessation. Eval Health Prof. 2009;32(2):14464. 23. Ossip-Klein DJ, Fisher S, Diaz S, Quiñones Z, Sierra E, Dozier A, et al. Tobacco use in six economically disadvantaged communities in the Dominican Republic. Nicotine Tob Res. 2008;10(5):85160. 24. Thompson ME, Fong GT, Hammond D, Boudreau C, Driezen P, Hyland A, et al. Methods of the International Tobacco Control (ITC) Four Country Survey. Tob Control. 2006;15 Suppl 3:iii128. 25. Brislin RW. Back-translation for cross-cultural research. J Cross Cult Psychol. 1970;1(3):185216. 26. McIntosh S, Sierra E, Dozier A, Diaz S, Quiñones Z, Primack A, et al. Ethical review issues in collaborative research between us and low-middle income country partners: a case example. Bioethics. 2008;22(8):41422. 27. Morwitz VG. The effect of survey measurement on respondent behaviour. Appl Stoch Models Bus Ind. 2005;21(4-5):4515. 28. Giné X, Karlan D, Zinman J. The risk of asking: measurement effects from a baseline survey in an insurance takeup experiment. Cambridge: Harvard University Center for International Development; 2007. Available from: http://www.cid.harvard.edu/neudc07/docs/neudc07_s4_p12_gine.pdf Accessed on 12 February 2012. 29. McMillen RC, Winickoff JP, Klein JD, Weitzman M. US adult attitudes and practices regarding smoking restrictions and child exposure to environmental tobacco smoke: changes in the social climate from 20002001. Pediatrics. 2003;112(1 Pt 1):e5560. 30. Ji M, Ding D, Hovell MF, Xia X, Zheng P, Fu H. Home smoking bans in an urbanizing community in China. Am J Prev Med. 2009;37(2):1326. 31. Pizacani BA, Martin DP, Stark MJ, Koepsell TD, Thompson B, Diehr P. Longitudinal study of household smoking ban adoption among households with at least one smoker: associated factors, barriers, and smoker support. Nicotine Tob Res. 2008;10(3):53340. 32. Escoffery C, Kegler MC, Butler S. Formative research on creating smoke-free homes in rural communities. Health Educ Res. 2009;24(1):7686. Manuscript received on 12 September 2013. Revised version accepted for publication on 2 January 2014. 1 Urban structure but in a remote location.